a month after Gabriel’s passing. 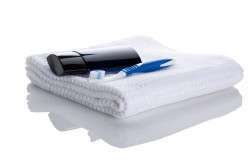 When asking the director of the sober house (where much grace and help was offered to Gabriel) how we could help him with the sober house, he stated the men seeking recovery help needed a clean towel and personal men’s hygiene items. From this, the Gabriel “Stay Clean” Project was birthed. The Gabriel Gift Packs are donated once a month, as needed, to Sober Solutions, a sober house for men in Louisville & Indianapolis and to other men’s sober houses as requested, if we are able. The outpouring of support through donations causes much joy! Since May 2013 we have been able to donate close to 500 Gabriel Gift Packs (GGP’s)! Purchasing a Gabriel “Stay Clean” Pack through the online store is simple & easy! Just click on the Shop icon on the menu screen. For those in the Louisville, KY area, if you would rather purchase items yourself without using the online store on the website, we would gladly accept your donation. This is an ongoing monthly practical outreach in which anyone, anywhere can partner and help a man coming off the street to “stay clean.” If you are a person who has a heart for mercy ministry, we welcome you and would be blessed by your involvement. Even though the Gabriel “Stay Clean” Project is based in Louisville, if you are from another city or state, consider starting a “Stay Clean” Outreach Project in your area! And yet, another mother started a similar project in memory of her daughter, Maegan Mills, called Butterfly Backpacks. The idea is to take the memory of your loved one and give the sack packs filled with personal hygiene items in their honor. No problem if you don’t know where to start!